Yes, Tori and I had fun on the slopes----it was her first time, even though she actually lives in Alaska. 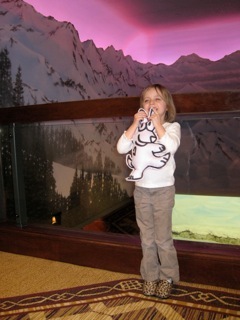 She has a very generous grandmother, Gena, who gave her a three-day stay at the Alyeska Resort as a birthday present. I'm happy I was included! We're just heading to the dining room to have a 5th birthday party! Yipeeee--I love parties!